An assortment of The Harbor's tri-tip tacos. Photo by Brian Addison. That is the cost of The Harbor’s lunch combo. Now, before I dive into what this specifically consists of, I have to begin with a prologue: Food writing often comes with this very authoritative, “No, no, little one!” when it comes to talking about dollar signs in food. “You judge the food on its merits and its merits alone!” the pundits proclaimed. I am not too keen on this form of food writing because it’s deceptive, if not outright ignorant that food—at its core—is sustenance and while the culinary arts have altered the way we take it in, the questions of Who is this food for? is a question food writers can no longer ignore. One of The Harbor’s lunch combos. In front, a BLTA with a bowl of their chili. Photo by Brian Addison. 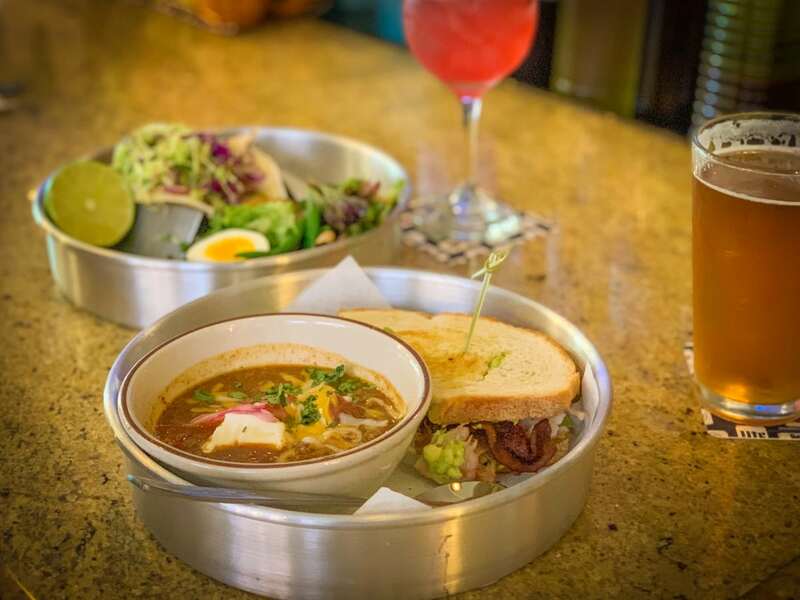 At The Harbor, this means getting your choice of non-basic salads—including a parred down niçoise that, despite the lack of tuna, is solid—with soups and sandwiches and, perhaps most noteworthy, one of The Harbor’s tri-tip tacos. The Harbor’s lacquered chicken bits. Photo by Brian Addison. Smokey, tender bits of tri-tip shoulder (though Krajacic isn’t a formally designated pitmaster, his abilities to handle smoking and barbecuing beef with such consistency shouldn’t be dismissed) are stacked on top of salty french fries, lathered in pickled cabbage slaw, and topped with a not-too-spicy roasted jalapeño salsa. 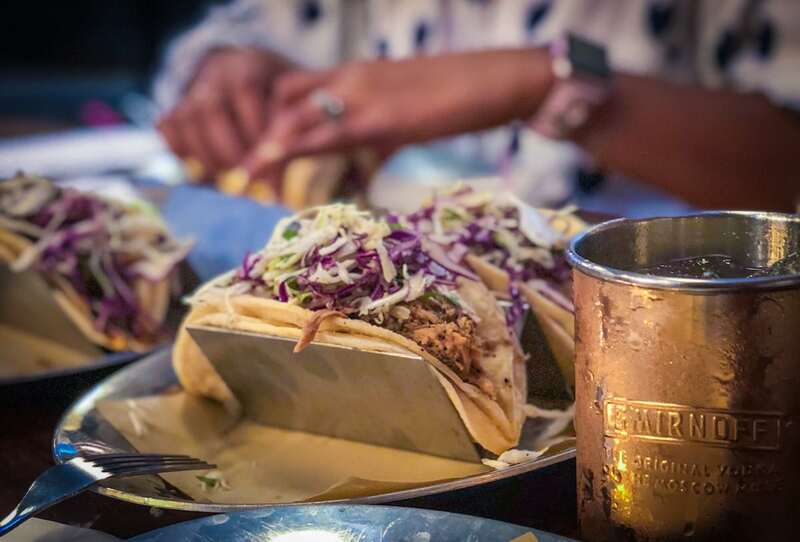 Layers of smoke, salt, acid, and creaminess create a taco that is as addicting as it is unique. This isn’t to say The Harbor or Pier 76 are necessarily cheap; what I am saying is that you can have a quality lunch and a beer (day job permitting) for under $15, and that is impressive and inclusive in a time when tacos that are ayyyyight are hitting $4 a piece. (And, let’s be honest: free games like skee ball and pool make it an adult playground as a bonus.) 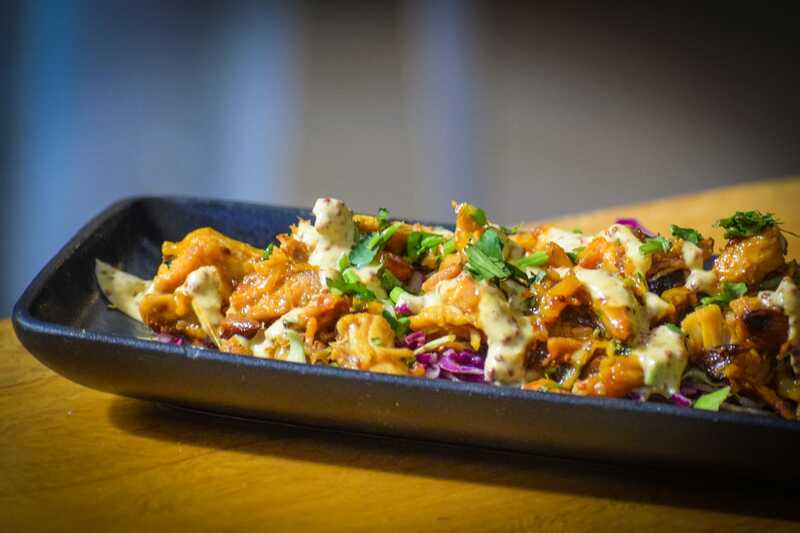 Even beyond that, the quality of food at the prices being offered, especially during happy hours and specials, are ways for folks to escape the daily drag of cooking for themselves and enjoy a bit of respite. The Harbor’s Dirty Bird Loaded Fries. Photo by Brian Addison. And even if you aren’t seeking relief from spending, The Harbor manages to appeal to practically every sector of eaters. It’s an American menu, through and through, highlighting both Krajacic’s talent with land-based proteins—as exemplified in his tri-tip tacos and his stellar Koji-aged hangar steak, which uses the Japanese fungus to speed up the dry-aging process—that seems almost entirely missing from his Pier menu. Take, for example, his Angry Mussels. Now, for those that haven’t had Krajacic’s seafood (or his food in general), the highlight has always been the cleanliness in his approach to food. Eschewing complicated preparation, his plates are simultaneously simple and complex, and this plate is one of the dishes that make this talent shine brightest. Jalapeños and garlic chili emulsion are blended into a white wine broth—think of it as the angry-but-addicting cousin to Krajacic’s moule frites at Pier 76—and, with the addition of an earthy, oily manchego cheese, it’s a fiery dish that complements the vibe of The Harbor. 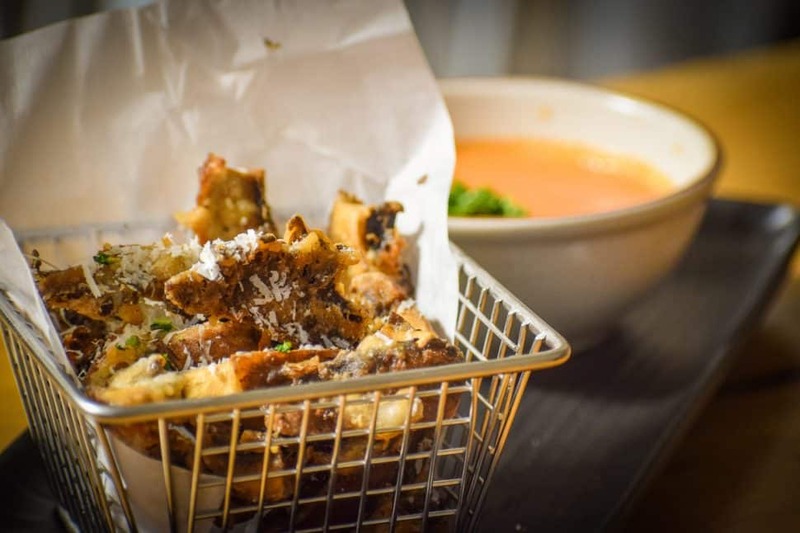 The Harbor’s portabella fries with tomato bisque as a dipping sauce. Photo by Brian Addison. 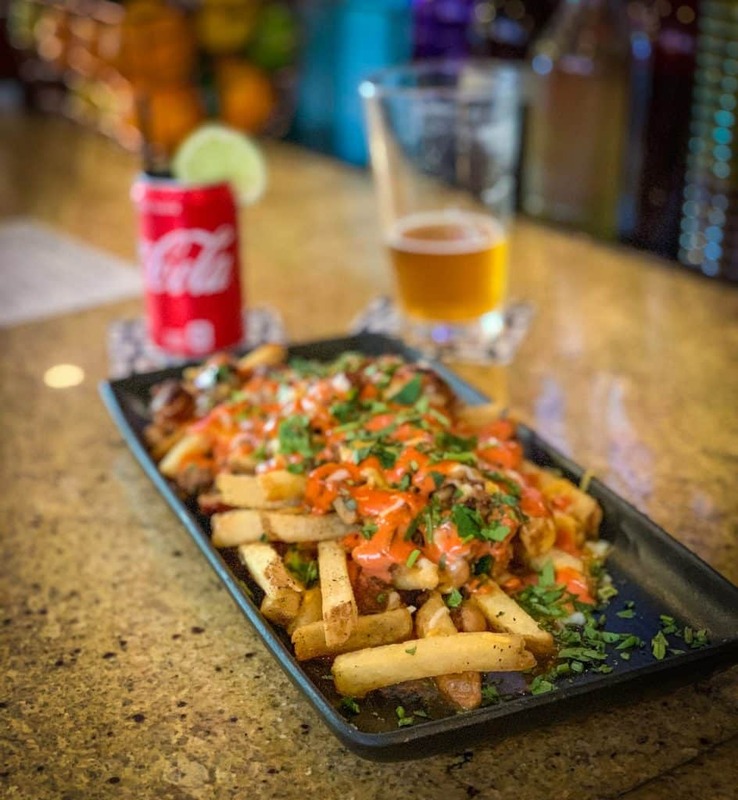 For those looking to skip the cleanliness and go for a I’m-hungover-and-I-just-want-comfort-food, the Harbor’s Dirty Bird Loaded Fries are an American take on carne asada fries: smoked chicken tossed with the house chili, a genuinely good, deep maroon concoction of beef chunks and pinto beans, layered with bacon, cilantro, cheese, and a bright orange remoulade that I would suggest asking for an extra side to accompany this already-rich platter. Whether you’re in search of a little Hair of the Dog or you’re genuinely searching out great cocktails, The Harbor has invested in the talent of David Schmidt—one of the guys behind the much-missed Cielo beverage program atop the Breakers in Downtown—and it was worth the investment: smart, fun, dangerously sippable, Schmidt’s cocktail program plays with classics—his Coca-Cola Anonymous, his version of a rum and coke, is the best rum and coke you’ll ever have thanks to quality rum (Mount Gay) and a clove-lime mixture that is beautifully tart and earthy—while offering an array of creations that are both tasteful without losing their playfulness. 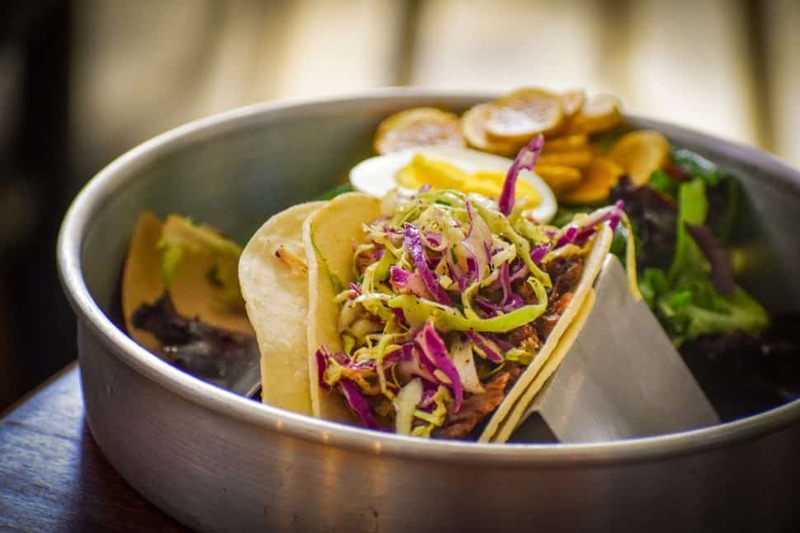 The tri-tip taco with a niçoise salad. Photo by Brian Addison. In all frankness, I should have written about the food at Harbor long before it created its lunch menu but there is something really beautiful to expound upon here: The Harbor—as well as those other Downtown gems, such as the divine Ammatolí and the stellar The Ordinarie—would have been unable to exist a decade ago in Downtown. Uninspiring sports bars and tacky nightclubs ruled the day, with its normal operating business hours feeling nonexistent with empty streets. The fact that not just a few but several restaurants are able to operate consistently is a testament to Long Beach’s resilience. The Harbor is located at 130 Pine Ave.